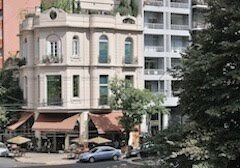 Whenever I return to Chile, I spend several days in Santiago—a city that I enjoy—for partly procedural reasons. One of those is dealing with my car which, of necessity, is parked at a friend’s weekend house in the coastal range village of Caleu, about 70 km north of the Chilean capital. There’s only one bus per day to Caleu, so getting there involves taking a bus to the town of Til-til and then contacting my friend’s caretaker, who descends from the mountain with my car. I then drive him back to Caleu and return to Santiago. Some of those in Caleu get around on horseback, but I store my car there. 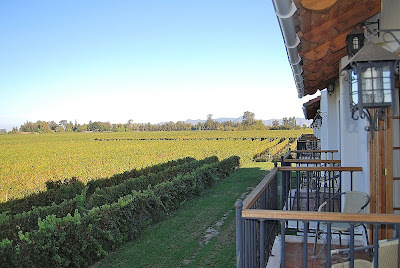 That’s what happened last Sunday, and I planned to take the car to my mechanic on Monday for a quick checkup before heading south toward the Los Lagos region and Patagonia, with a stopover in the Colchagua wine country. 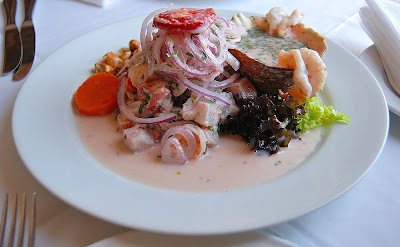 I also planned to renew my permiso de circulación, the car’s annual license fee, in Santiago, and then spend the rest of the day enjoying the city I described in my recent National Geographic Traveler article. My share of the fender-bender damage. There was a glitch, however. 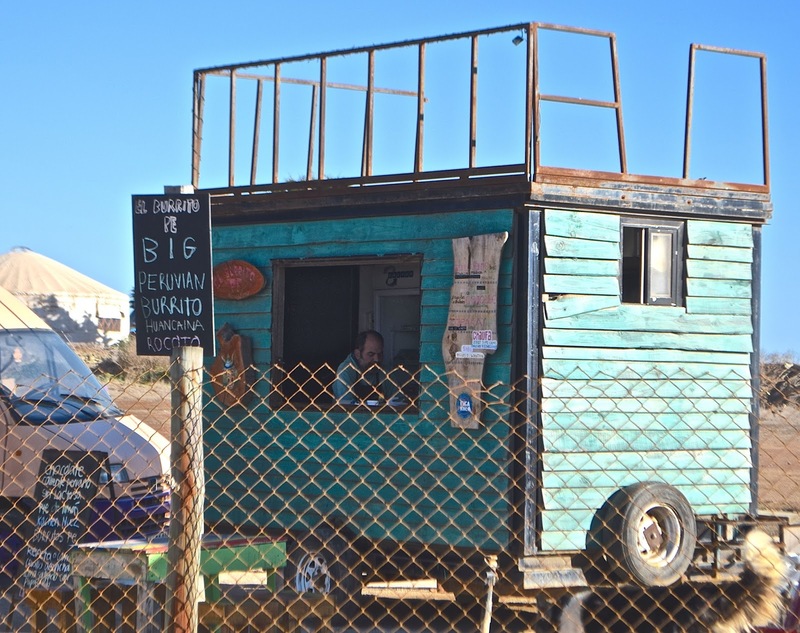 The drive down the mountain from Caleu and on Ruta 5, the freeway to Santiago, was uneventful. 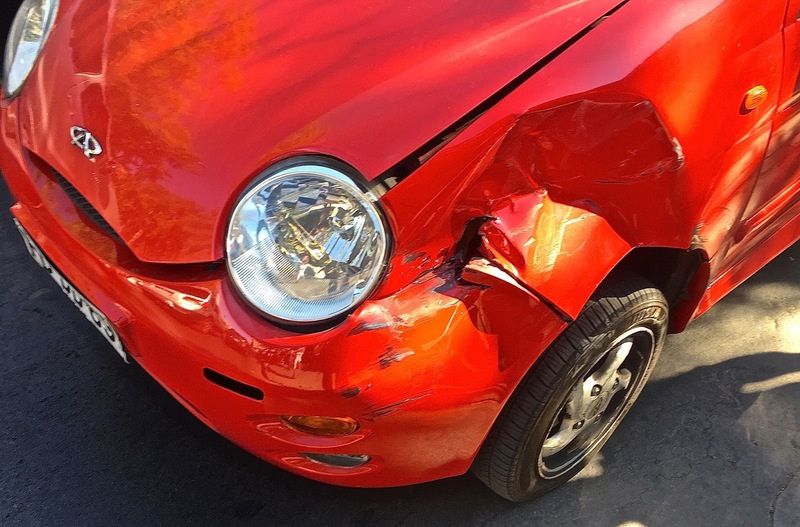 But when I turned off the highway into the denser downtown traffic, I erred by turning left onto a busy arterial and, suddenly, a small speeding car clipped my right front fender. Both of us spun around but, fortunately, no other vehicles became involved and nobody was hurt. The other guy got it worse. The damage to my own car was minimal, while the damage to the smaller car was greater, but both remained functional. There followed a civil exchange of identity documents and insurance, and cell phone snaps of the vehicle damage. We each went on our ways in short order, with the assurance that we would contact our insurance companies. I then proceeded to collect my luggage at the Hotel Magnolia, where I’d stayed the previous three nights, and moved to a friend’s house in the outer borough of Renca. 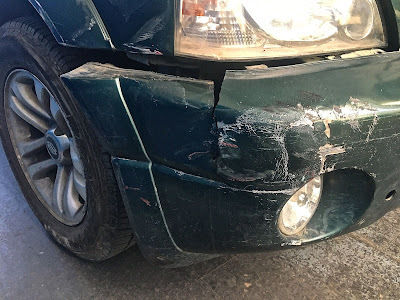 The following morning, I dropped my friend off at her job and then drove to my mechanic’s garage, where they were unsure whether they could repair the damaged plastic bumper or would have to replace it (I’m old enough to remember when automobile bumpers were sturdy steel). 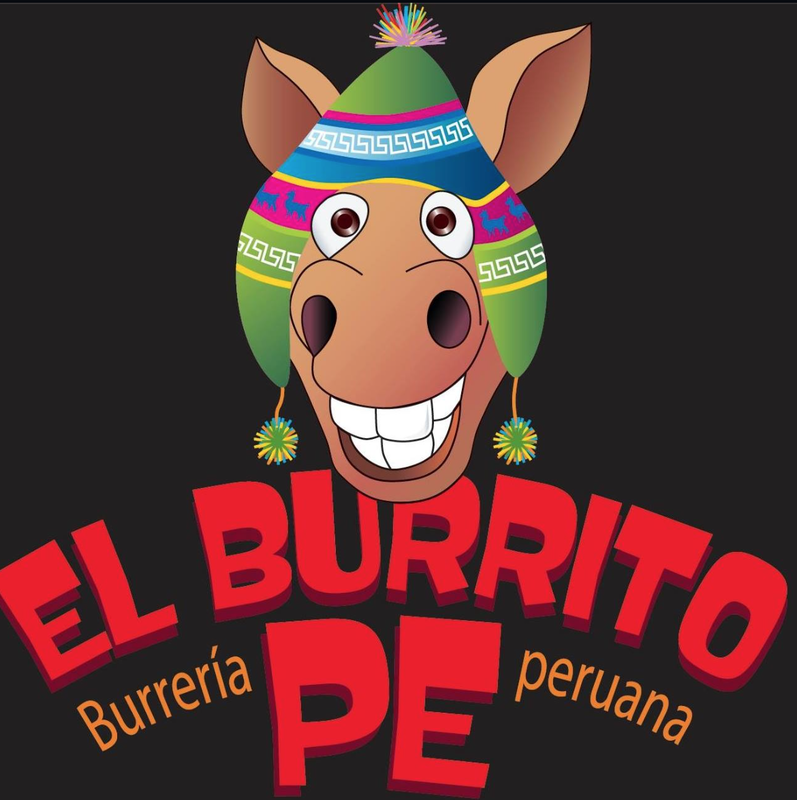 I left the car and then proceeded downtown, where I first renewed the permiso de circulación at one of the many sidewalk tents the city sets up at this time of the year, and then continued to my insurers’ offices. 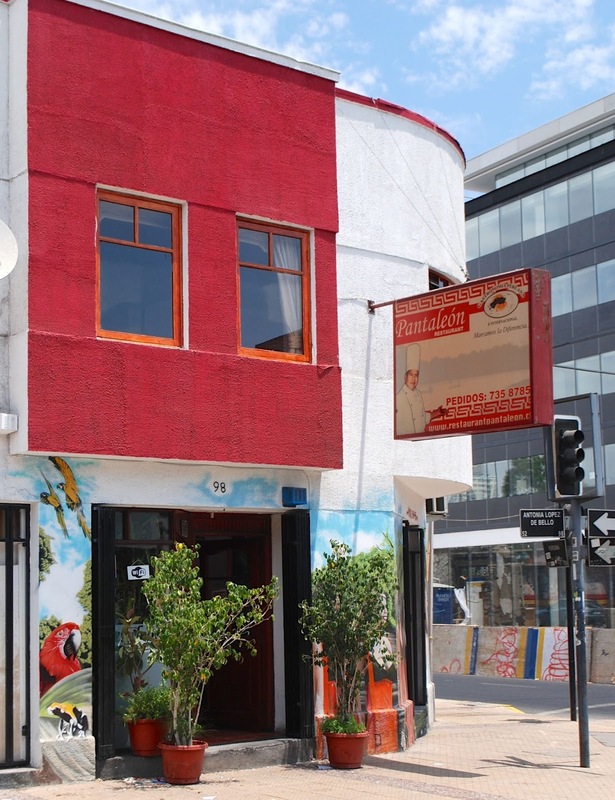 Fortunately, the offices were not yet busy—Chileans tend to be late risers—but there were glitches. I preferred to make the accident report face-to-face, but the office agent referred me to one of their onsite computers. Their website, though, wouldn’t accept my RUT tax ID because it was “corporate” rather than personal (as a non-resident foreigner, this had been my only option for purchasing a vehicle). 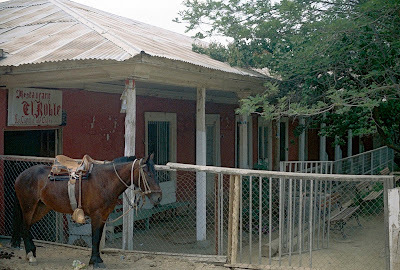 That meant I had to make the report by telephone, on a line with substantial interference and, although I’m fluent in Spanish, it was not easy to understand the well-meaning young man at the other end. In the end, though, I succeeded and, after a quick lunch, I took a cab back to my friend’s house for a nap because I hadn’t slept much the previous night (though it wasn’t because of worry about the accident). 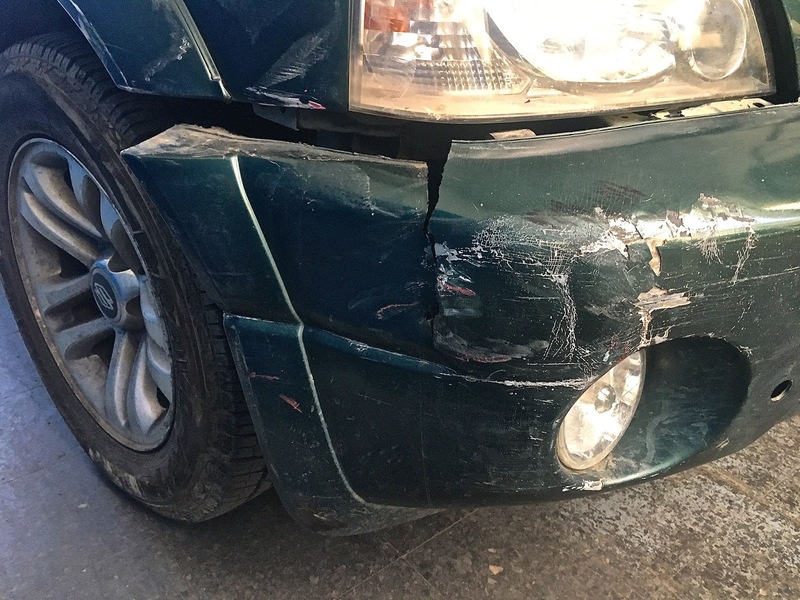 The next morning, I was pleased to learn that my mechanic had managed a capable repair of the damaged bumper, thus avoiding a more expensive replacement. This is better than car chores in Santiago. That also meant I’d be able to continue my excursion to the Colchagua valley wine district—arguably, the Napa of South America—as I had originally planned. There’ll be more about that stay, which began Wednesday at Hotel TerraViña in Santa Cruz, in the near future. Argentina’s a small country, after all. In Ushuaia after a late arrival from Buenos Aires, my wife María Laura and I took a short walk from our cozy hillside B&B down to Kalma, a sophisticated restaurant whose talented young chef Jorge Monópoli turned out to be her brother’s former physical education student in the northern Patagonian town of Villa Regina. Recently relocated to stylish contemporary quarters, Kalma rewarded us, at day’s end, with creative versions of king crab appetizers, Patagonian toothfish (often called, inaccurately, Chilean sea bass) and Patagonian beef. 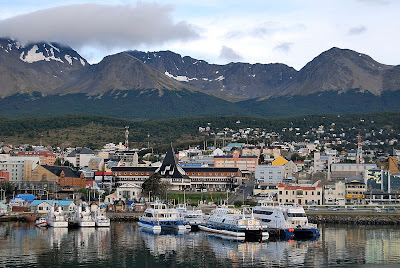 When I first saw Ushuaia in 1979, as a budget backpacker in the aftermath of the near-war with Chile over the Beagle Channel, it still felt like “the uttermost part of the earth” that the Fuegian pioneer Lucas Bridges described in his memoir. 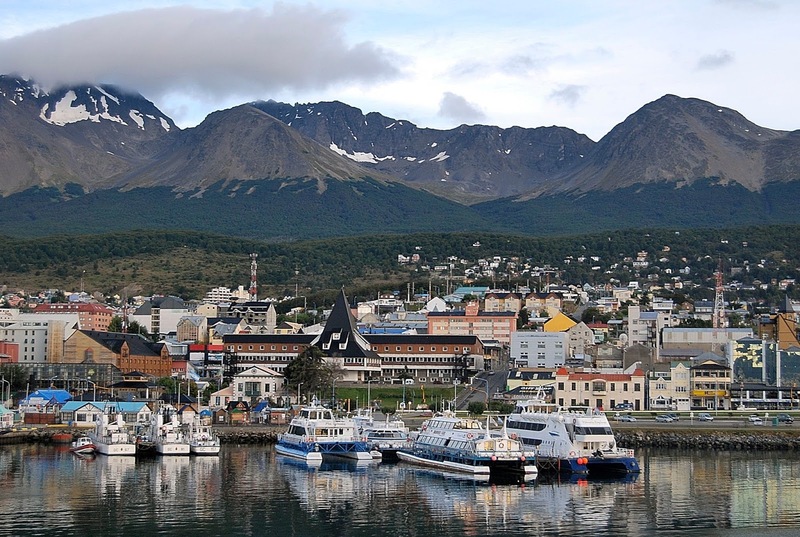 In the interim, I’ve revisited at least a dozen times but my wife—from Olavarría—hadn’t had the experience of seeing a town grow into a city that’s become a major international destination and the gateway to Antarctica. 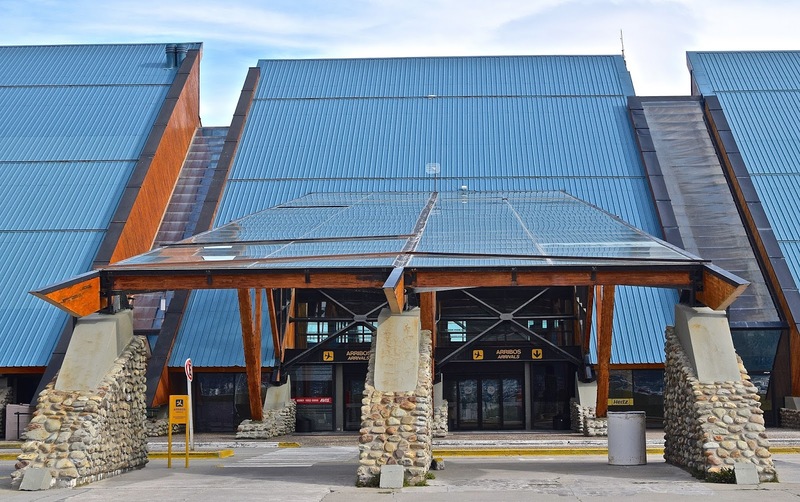 Ushuaia's international airport has helped make it the gateway to Antarctica. In fact, I’ve seen far more of Argentina than she probably ever will. California has been our home for more than three decades, but I’ve made a career out of traveling in the Southern Cone countries and writing about them for several different publishers. I’ve driven hundreds of thousands of kilometers through every Argentine province, but only rarely have we traveled together. 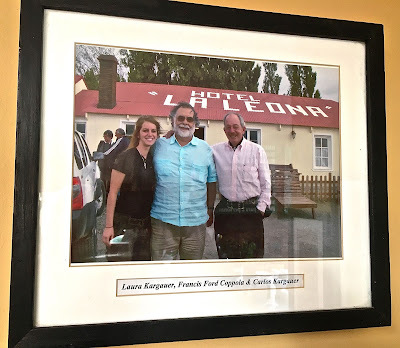 In December, though, I had the opportunity to show her some of the places I’ve visited repeatedly while she, with a fixed job, could mostly only dream about. The Arakur has its own forest reserve, with hiking trails, on Cerro Alarkén. 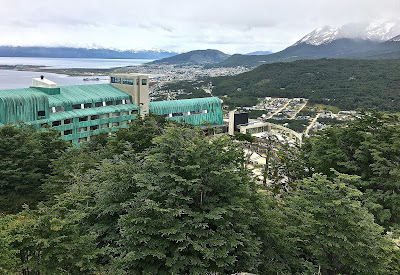 That said, I hadn’t seen everything in and around Ushuaia. Two years earlier, a summer snowstorm whiteout had kept me from visiting the hilltop Arakur Ushuaia Resort, but this time we were able to hike through its Cerro Alarkén forest reserve and lunch with views of the Channel. 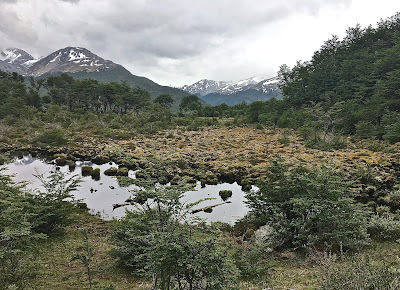 I’d always wanted to hike the steep trail up Cerro Guanaco, in Parque Nacional Tierra del Fuego, but my work obligations and the weather had never cooperated until our second full day. 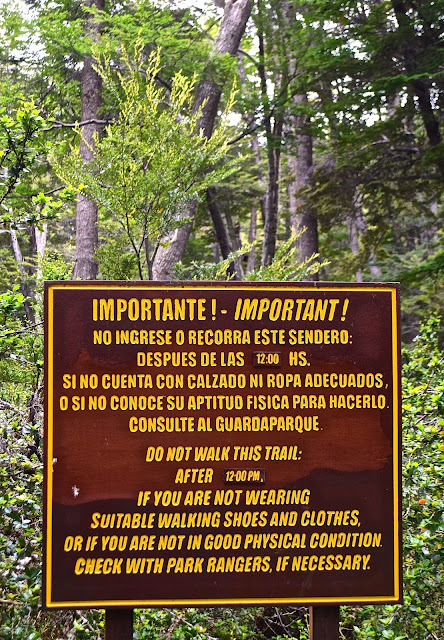 Then, we rented a car and drove to the trailhead where a bilingual signpost warned us that “If you are not wearing walking shoes and clothes…” you should not continue. 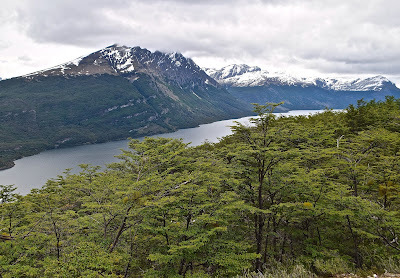 In fact, as we climbed the switchbacks, a chicly kitted porteño couple critiqued my footwear. 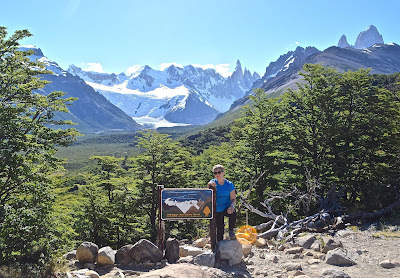 We received condescending encouragement from younger hikers even though we had reached an overlook, where we could see down the slopes to Lago Acigami (ex-Lago Roca) and across the Channel to Chile’s Isla Navarino, ahead of them. The day’s only regret was that a late start kept us from visiting Harberton, the Bridges family’s historic farm. 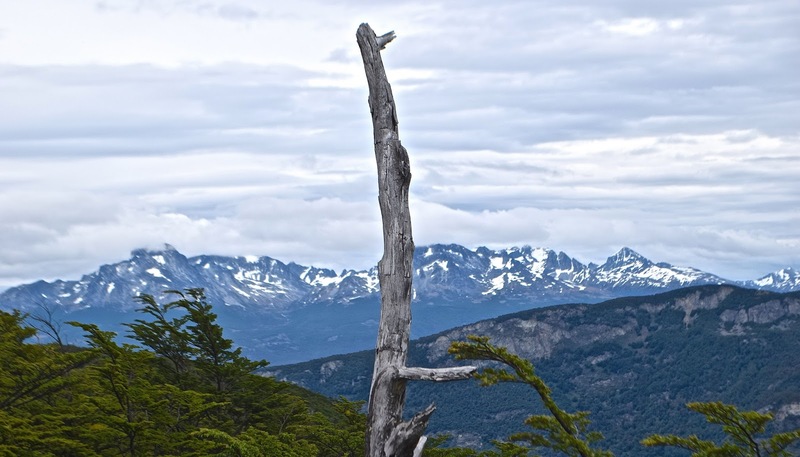 Views from the Cerro Guanaco overlook include Chile's Isla Navarino, across the Beagle Channel. 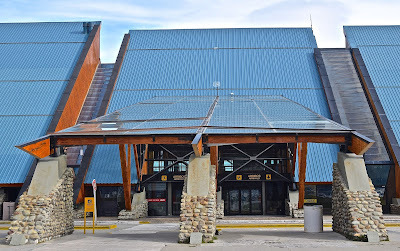 From Ushuaia, we flew on to El Calafate, where María Laura’s cousin resides but was leading a foreign tour group elsewhere. 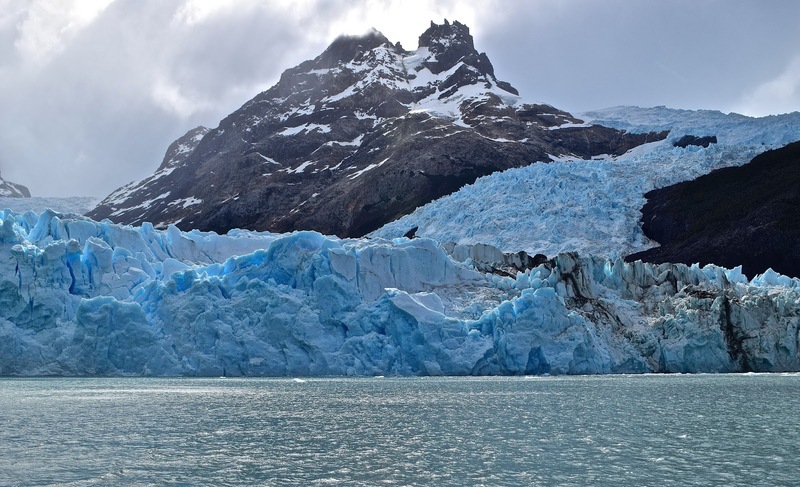 We’d both been there before and, because the local tour operator’s rigid guidelines deemed me too aged for a hike on the ice—which I’ve done elsewhere—we declined to visit the Moreno Glacier once again. Instead, we chose a leisurely catamaran day trip on Lago Argentino where, unfortunately, the company’s photographers badgered everyone to order cabin snapshots and park regulations kept our vessel from approaching the Upsala Glacier (though we saw the Spegazzini at audible range). 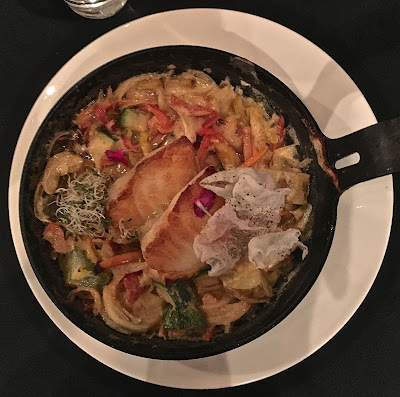 We more enjoyed our stay at the Hotel Kosten Aike, for its quiet comfort, first-rate service and walkability to restaurants like the hybrid wine bar La Zaina, with its rustic décor, and pleasantly surprising pub grub at the Mako Premium Bar. 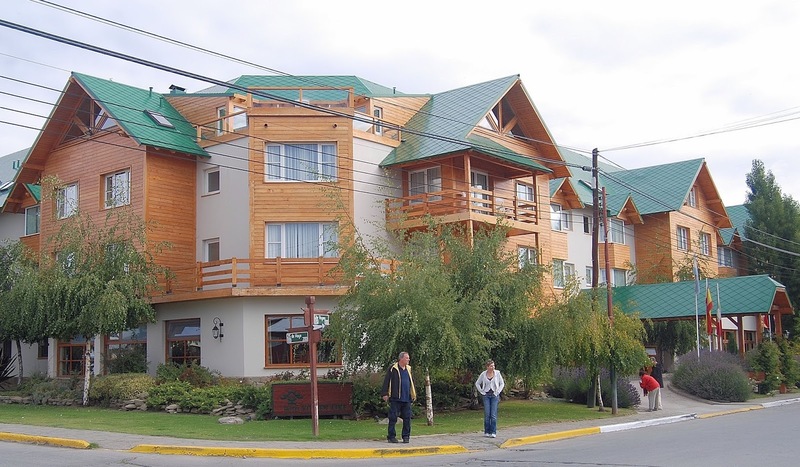 Hostel Kosten Aike is easy walking distance from nearly of El Calafate's restaurants and other services. 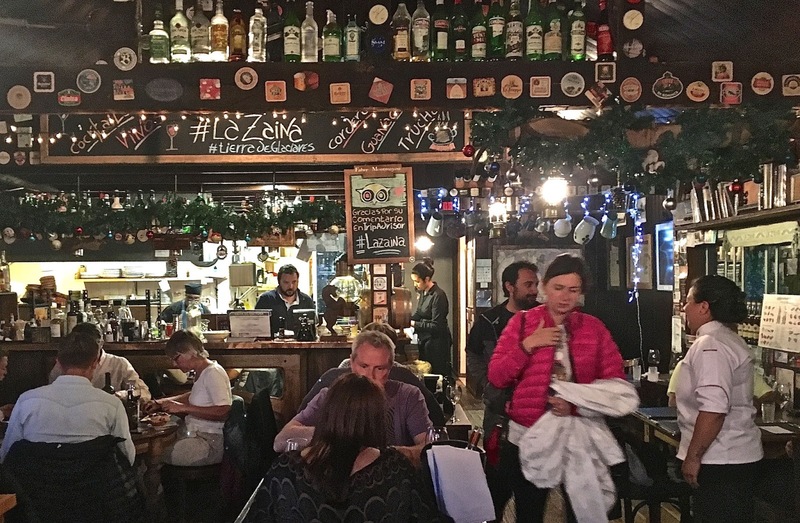 La Zaina is one of El Calafate's best dining (and wining) options. 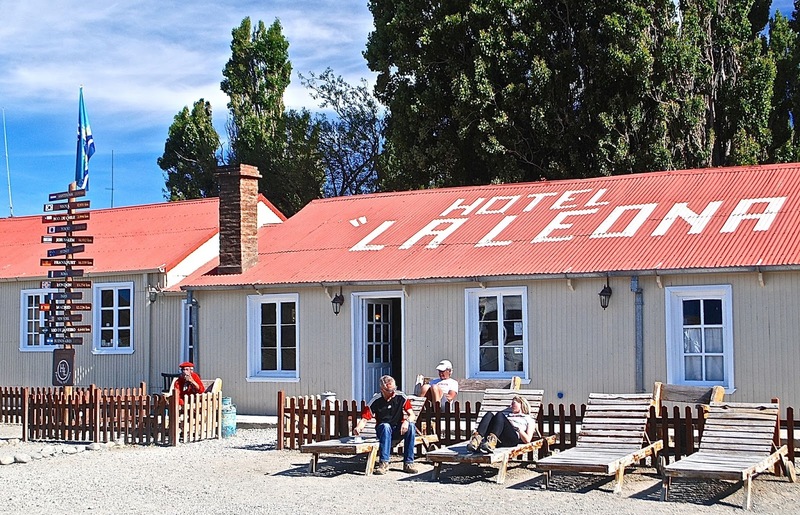 La Leona is a popular stop along the highway from El Calafate to El Chaltén. 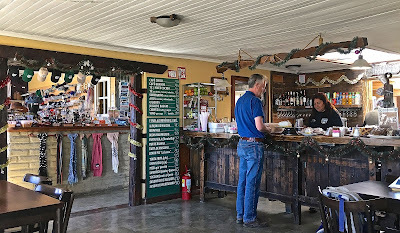 The interior of La Leona includes a snack bar and souvenir shop. Since we’re avid hikers, my wife had long wanted to visit El Chaltén, so we hired a car to reach Argentina’s “trekking capital.” En route, we stopped for snacks at the photogenic Parador La Leona, a rejuvenated roadhouse that’s retained a certain rusticism even as it’s become a stop for tourist buses en route to Chaltén and points much farther north along Ruta 40. Its current owners, the Kargauer family, have cinema connections and Francis Ford Coppola even paid a visit here. 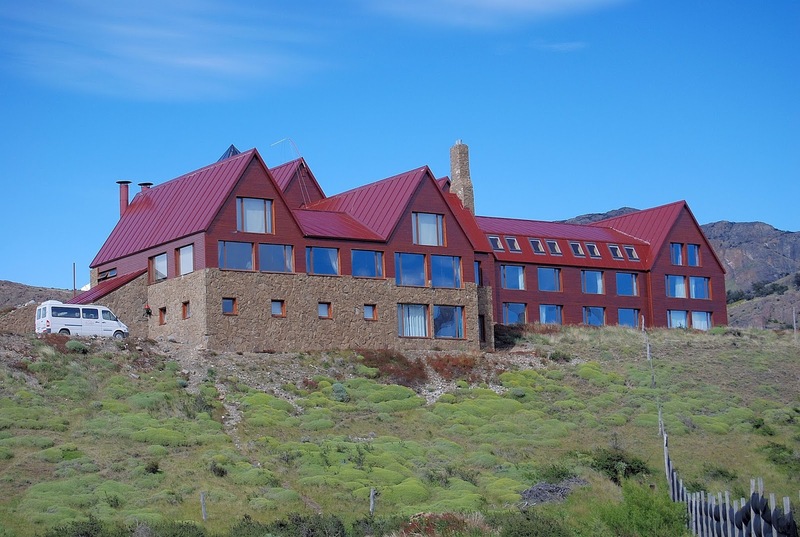 The Hotel Don Los Cerros sits atop a promontory in the middle of El Chaltén. Even with a late arrival, the long December day permitted her an afternoon hike toward the iconic Cerro Torre—which I’d done several times—as I caught up with some writing at the Don Los Cerros Hotel, a luxury lodge atop a promontory that offers panoramic views of the town and its surroundings. 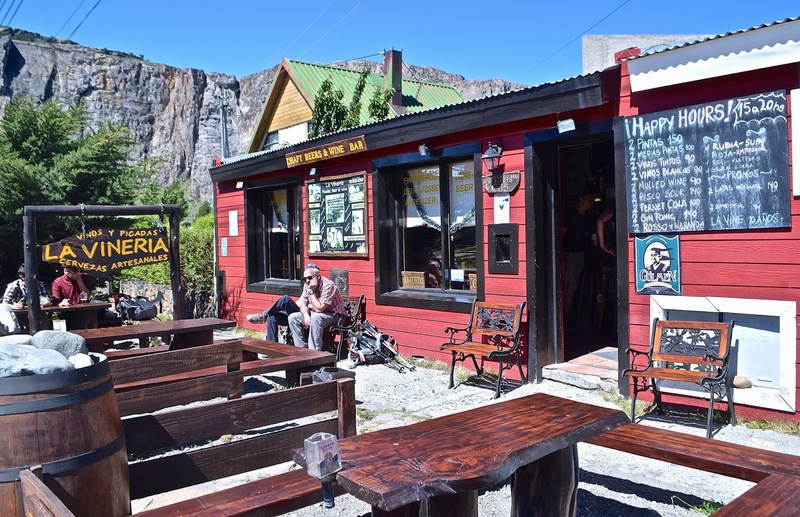 When she returned, we walked down the hill to La Vinería, Chaltén’s only dedicated wine bar, for some empanadas and a glass of Malbec. Even for a village that lives off tourism, the quality of services—both accommodations and food—is remarkable here. My personal favorite is Estepa, where a succulent lamb with a calafate sauce is the specialty. 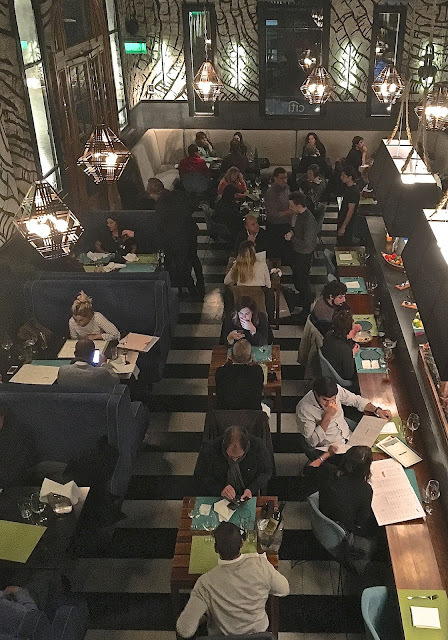 For fine days, La Vinería has sidewalk seating. We’re both also avid cyclists and, the next morning, we arranged an excursion with the Travellers’ Hostel Patagonia, which hauls riders and bicycles to Lago del Desierto—an area where Argentine and Chilean forces staged a 1965 firefight over the precise location of the border. 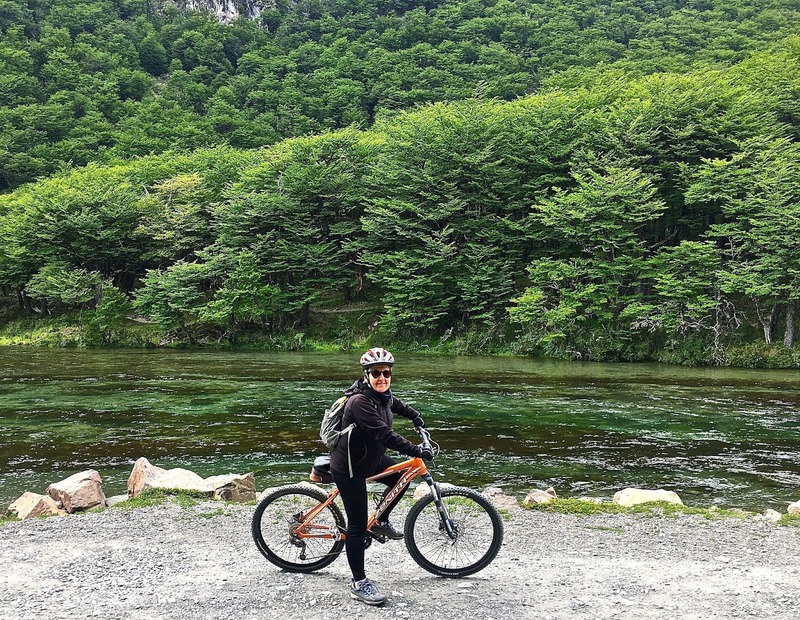 Now, a truly adventurous route leads by boat across the lake and then overland into Chile, where another vessel carries cyclists and hikers to the Carretera Austral, Chile’s dazzling Patagonian road. 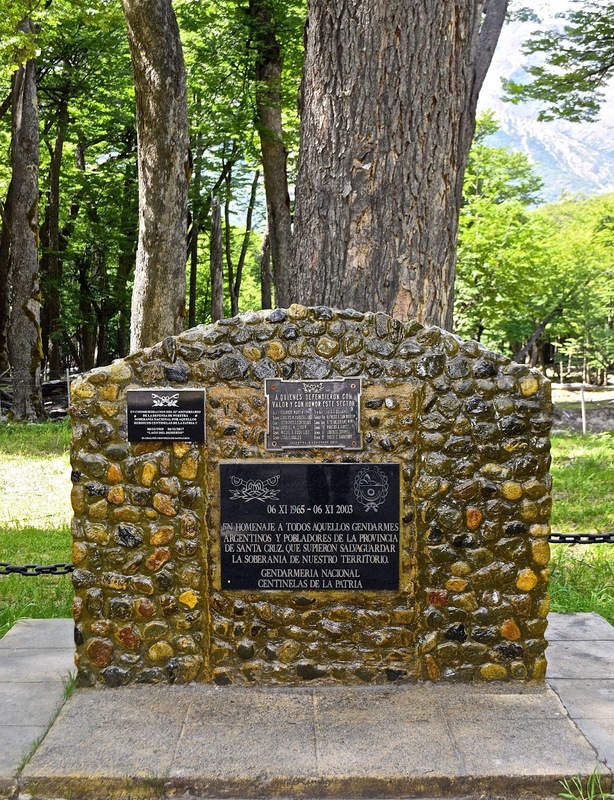 At what is now Plaza Soberanía, Chilean Carabineros and Argentine gendarmes had a 1965 firefight over the location of the border. We had neither time nor resources to do that, but we unloaded the bicycles to pedal the 37 kilometers back to Chaltén with the wind at our backs—viento a favor. My friend Javier Vásquez, who organizes the excursion, gave us the option of phoning for a pickup if we tired or the weather worsened, but we were fine until about four kilometers short of town—when María Laura’s bike suffered a flat. As we pushed our bikes back to town, that didn’t flatten our spirits even as the wind worsened and, with rain the next morning, we decided to depart early for El Calafate. 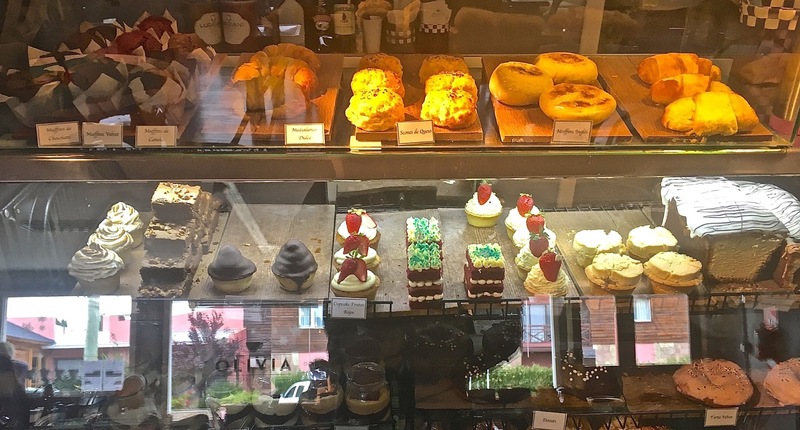 The Olivia Coffee Shop has a fine selection of pastries. Back in Calafate for a night, we moved uphill to the Hotel La Cantera, which gave us a view of the town and, after dinner at the now classic Casimiro Biguá—where our bill included a 39-peso “covert charge”—a more strenuous climb to burn off the calories. At mid-morning the next day, we met María Laura’s newly returned cousin for brunch at the new Olivia Coffee Shop, where the Scandinavian in me found a delectable cinnamon roll. 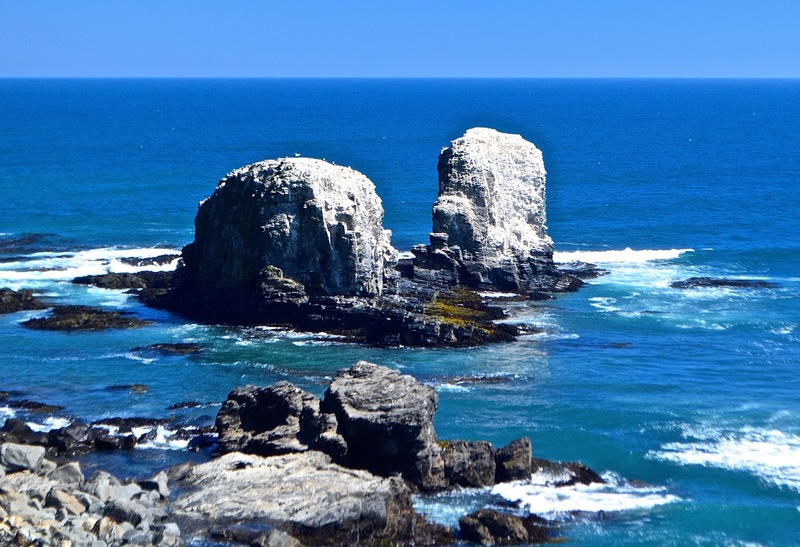 I’ve often heard the comment that, doing what I do, “You’re getting paid to be on vacation,” but visiting these places has always been a job—a pleasurable job, but a job nonetheless. That afternoon, though, as we boarded our flight back to Buenos Aires, I felt the satisfaction of having been on a vacation of sorts, or at least having accompanied a loved one on vacation.